Need some reading for the weekend? Google has you covered. 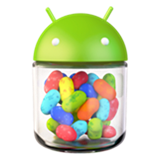 To celebrate the shipping of the first batch of Nexus 7 pre-orders, Google has posted up the full, official, exhaustive changelog for Android 4.1 Jelly Bean. Covering everything from Accessibility to Widgets, the changelog delivers comprehensive explanations of each and every change users can expect to find in Android's latest iteration, as well as changes to Google apps and the "new Google experience on Android," including Google Search and Google Now.